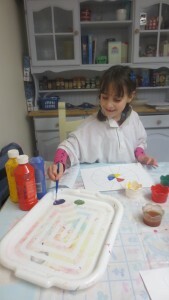 I thought it might be a nice idea to teach Anna about the principles of colour in that you really only need 3 colours to make a variety of different ones. 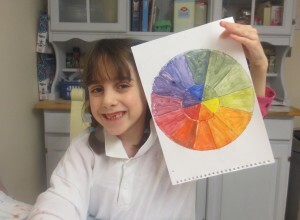 I created 2 different types of colour wheels (well Anna’s wasn’t a wheel at all, but still). 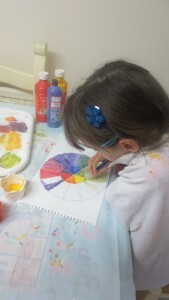 We chatted about the primary colours, mixing colours and what happens if you add more or less of one colour. 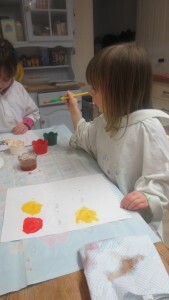 The girls then set about making their colour charts. 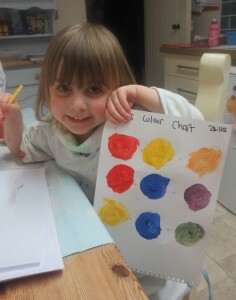 This was a good exercise for Elsa as it showed her that to make darker or lighter shades all she had to do was add more or less of one of the primary colours. 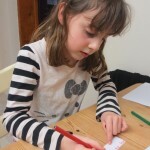 Every day Elsa does a selection of the following, Maths, History, Science, English and Geography, which she enjoys and normally it’s only mornings. 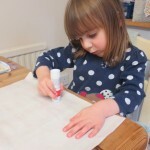 In the afternoons we do things with Anna as she’s home from nursery, often related to what we’ve been doing in the mornings. 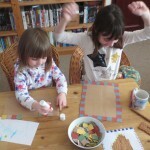 For instance, if Anna had been at nursery for the first morning after the Christmas holidays, Elsa and I would have learned about the Roman Empire and started our India geography topic, however she wasn’t so we did a Roman mosaic craft instead. 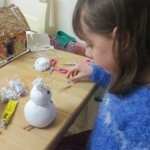 But as the title suggests, on Fridays Elsa is able to choose exactly what she wants to do. Sometimes she chooses to continue with work we’ve been doing in the week because she’s finding it interesting. 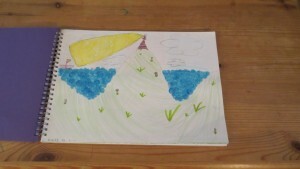 Other weeks she chooses to do some drawings in her art book. 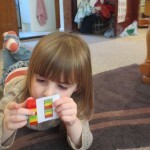 which she can often spend hours doing that as it’s her favourite pastime. 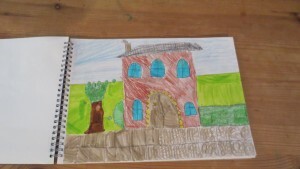 Until this week, that was all she’d chosen to do, but she’s becoming really detailed in her pictures and it’s really great for me to see her progressing and becoming more confident with her drawings. 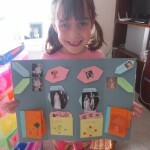 This is her favourite and most recent picture. 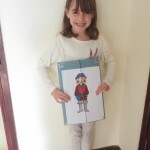 Obviously it’s not just drawing she can do, she can do whatever she would like to. 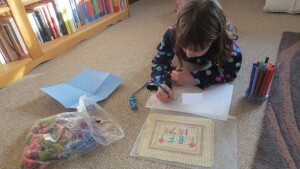 When we started home educating, to give her some ideas, I’d shown her a cross stitch I’d made when I was at primary school. 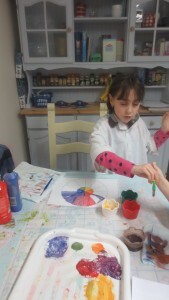 She said she’d like to do one, and last Friday she spent some of the morning designing hers and choosing the coloured cottons she’d like to use. 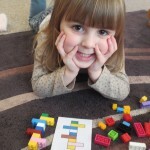 Elsa mentioned that she’d enjoyed learning about Romans when she was at school, but told me it was taught a bit quickly for her, so she wanted to go over it again. 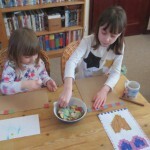 As it turned out our first day ended up changing a little bit as Anna wasn’t at nursery as I’d expected, so we decided to design and create our own mosaics, which both girls enjoyed. Firstly, we chatted about where Romans would have used mosaics, what they were often made from, and what common pictures were made. 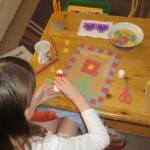 Then both girls designed their own mosaic on some squared paper. 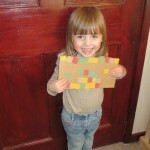 They used some cardboard as a base as it is sturdy and squares of different coloured card to make the designs. 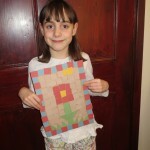 Finished mosaics. As you can see the designs of the mosaics weren’t exactly as their templates (not the same at all 🙂 ), however, that’s the beauty of it, the ideas evolve as they are creating. 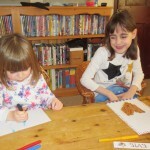 As you know, I have two children, Anna is at nursery most mornings, so Elsa and I can do all our ‘sit down’ work then, however sometimes Anna joins in with what we are doing and sometimes she doesn’t want to. She’s 3 so that’s fine. 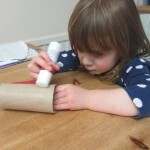 I was mooching around Pinterest, looking for inspiration and I stumbled across busy bags, which are self contained activities either stored in a box or zip lock bag (hence the name), which Anna can just grab from her tray and do on her own. I already had a few bits which I’d bought and was already using but put them in the bags so they were easier for her to find. 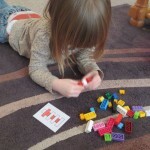 I then created Lego pattern cards and sorted out all the lego bricks she’d require to do it. 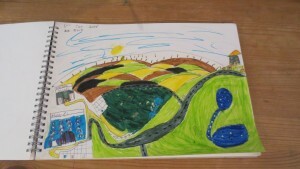 Then I had a look at this lovely website for some other ideas. 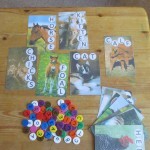 I’ve used the bottletop barnyard (but used big counters instead of the bottletops as they were super cheap on ebay), and the cupcake decorating ones so far, but there are loads of fabulous ideas. 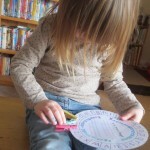 I’ve also printed clothes peg alphabet wheels from Confessions of a Homeschooler, however, Anna prefers the pictures to the letters. 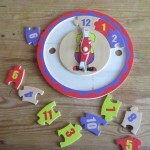 I think this is because the letters are backwards on the wheel to on the pegs (something to sort out when I get some free time). 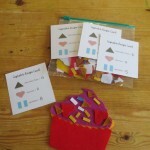 Anyway busy bags have been a wonderful, helpful addition to the resources we use. I will be adding more as they are relatively easy and cheap to make up. 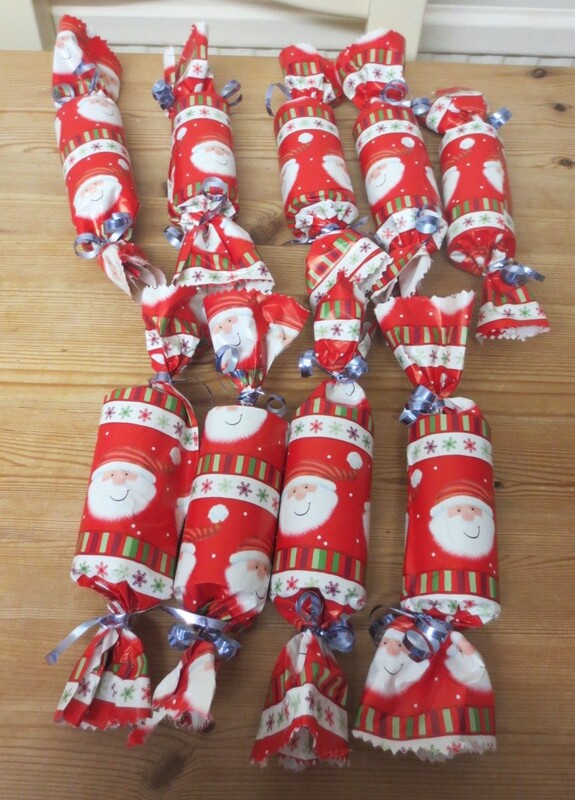 For the last few years we have made our own crackers and this year was no exception. They are really cheap and easy to do. I bought hats and snaps off ebay, very cheap and very quick delivery. 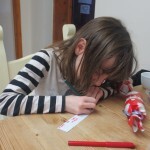 Elsa wrote some jokes, (typical of an 8 year old) :)and we put in a chocolate as the gift. 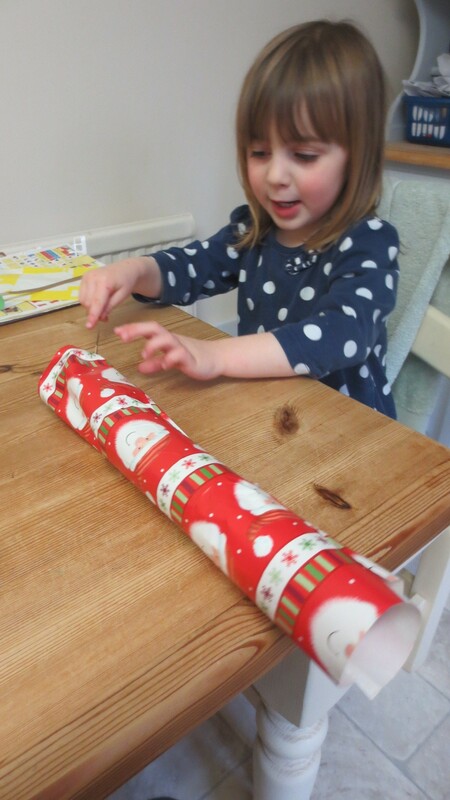 Next we wrapped up toilet rolls with Christmas wrapping paper. 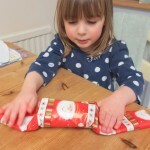 We put in the snap and closed one end of the paper with ribbon, then put in the hat, joke and chocolate. 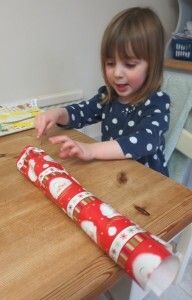 Then closed the other end with the ribbon then used pinking shears to pretty the edges. 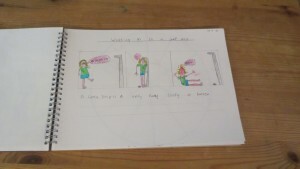 Tah dah, all finished. They look fantastic. Let’s hope they work on Christmas Day. Merry Christmas and enjoy the holiday season. 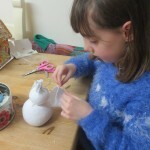 I love the run up to Christmas, we get all festive and do lots of lovely crafts. The internet is such a fabulous source of information, you can never run out of ideas. 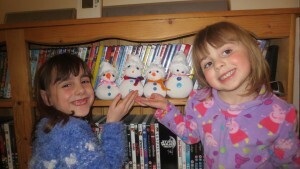 After seeing this cute little video on You Tube, we decided to give these lovely little snowmen a try. Firstly, cut off the foot part just above the heel then fill the foot part with rice (or whatever you want). 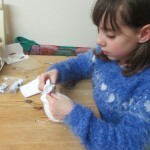 Tie some cotton to make a head and body. 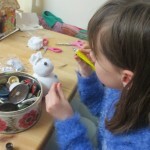 Glue on buttons, eyes and nose. 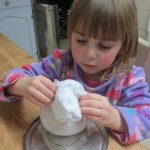 Then put the top half of the sock on as the hat. (easy peasy). 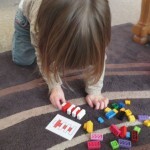 We have mentioned lapbooks a couple of times on the blog so far and I thought I’d explain what they are. 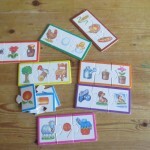 They are a creative way of displaying informational mini books, or a space for displaying drawings, worksheets, photographs etc. 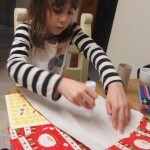 We use a square cut folder to create ours (we bought this many folders as they are really useful for keeping work separate/together, for sorting topics which I don’t want Elsa to do yet but I want to be organised and ready for). 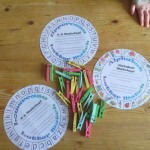 We have done a couple so far and we have used the Homeschool Share website for both. We downloaded the pirate one as a complete lapbook, but we only used some of it. We added our own mini books and paperwork to it. 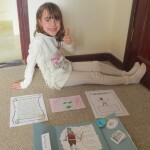 Elsa wrote a captains log, created a map and also did a wanted poster. 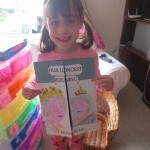 For the Longest Reigning Monarchs lapbook we created all of the mini books ourselves using the templates we downloaded. 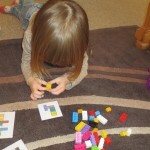 This way Elsa could decide on what she wanted to research and she then decided on which mini book would be most suitable for each part of it.